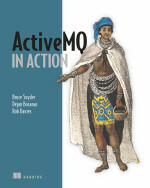 BruceBlog: 40% Off of ActiveMQ in Action! i tried to buy this via amazon and they said i wouldn't get it until Sept 1 !!! I'm heading to Manning for sure. Matt, you can download a PDF of the early access version of it now from Manning.